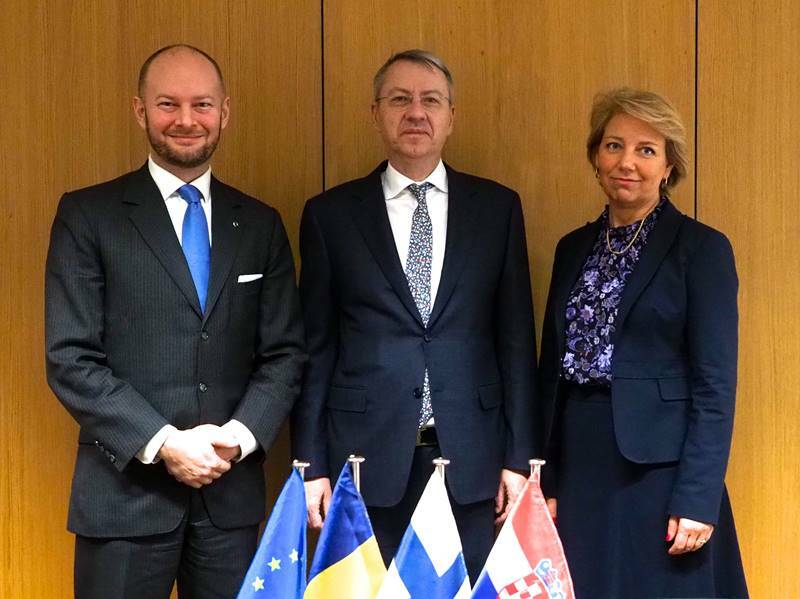 The Ministry of Foreign Affairs welcomes the endorsement of the programme for the incoming Presidency Trio – Romania, Finland, Croatia – by the General Affairs Council, which took place on Tuesday, 11 December 2018, in Brussels. Based on a long-established custom, the minister delegate for European affairs, George Ciamba, presented the key elements for the joint working programme of the Council of the European Union for the next 18 months (1 January 2019 – 30 June 2020), on behalf of the incoming Trio of Presidencies – Romania-Finland-Croatia. During his speech, the minister delegate thanked the Finnish and Croatian partners for the excellent cooperation during the process of drafting the working programme and underlined the priority topics and its main scope. The Romanian official stated that the three countries are committed to a realistic, pragmatic and flexible working programme, that should take into account the transition period during which this Trio will be acting, able to adapt to any new challenges that might arise during the following months. Minister delegate Ciamba emphasized the three key elements that will be defining the actions of the Trio of Presidencies, namely maintaining European unity and strengthening our European project, which become paramount on the background of the Brexit process and of the elections for the European Parliament; observance of political priorities already agreed upon at European level; and a more effective communication on the future of Europe. The minister delegate expressed Romanian commitment, as the first presidency of this Trio, to ensure a smooth transition from the Estonia-Bulgaria-Austria Trio and to take all steps needed in order to further the European agenda, while counting on the EU Member States support, as well as on that of European institutions. The Member States which take the Presidency of the Council of the European Union work together in groups of three countries, which are called “Trios”. This system was introduced through the Lisbon Treaty, in 2009. The Trio sets out long-term objectives and prepares a common agenda, thus determining the topics and the key issues to be tackled by the Council over an 18-month period. Based on this general programme, each of the three countries prepares its own, more detailed programme for their six-month mandate. The Trio of Presidencies made up from Romania-Finland-Croatia has a specific feature, compared to other previous trios: the fact that it spans over the period of two legislative cycles, as these countries are to cooperate in order to set out long-term objectives and to prepare a common agenda for the period 1 January 2019 – 30 June 2020. The programme for the Trio of Presidencies Romania-Finland-Croatia includes an introductory section that defines the scope, the mission and the background milestones of the three Presidencies. The sections of this document are built around the structure of the Strategic Agenda for the Union in Times of Change (as agreed during the meeting of the European Council of 27 June 2014), submitting common objectives, agreed by the three Presidencies for the period spanning from January 2019 – June 2020, covering the following key areas of priority: jobs, growth and competitiveness; empowering and protecting citizens; policies on energy and environment; freedom, security and justice; strengthening the European Union role as a global actor.